Adam Names The Animals and Us. It seems to me that the Proof of God is all about us. Trees, lakes, mountains, and the creatures that have the honour to serve us and then there is this Whole World that God has given us. It is the creatures that took my eye as I sat looking out of the window, across the lawn, and into the forest beyond and around, and Lo! 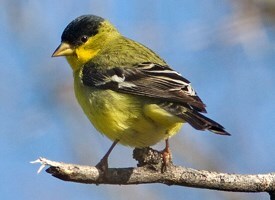 There was a bird on the lawn – I referred to the original copy of Audubon’s “Birds of America” which I have kept in safety for the Church for the past 40 years in my bookcase – it was a Lesser Goldfinch! As with anyone, this made me think that there must be a whole series of Goldfinches, starting from the Greatest Goldfinch down to the Least Goldfinch with “Goldfinch” sitting in the middle. We recall Gen:2:20 And Adam gave names to all cattle, and to the fowl of the air, and to every beast of the field; but for Adam there was not found an help meet for him. “That’s a buzzard because it looks like one.” etc. The above may not have happened exactly in that order; we Biblical scientists do not go around making bold unsubstantiated statements and claiming them as the absolute, irrefutable, obvious truth! That would be ridiculous. But what is absolutely certain is that the first one he saw, (and it would have been on a Saturday because that is when most people go bird-watching,) was the middle one, otherwise the names could not have worked out. So there we have a new Biblical fact. Of course, God does not send direct messages to people – at least, He has not sent many recently and that is because He said most everything in the Bible and hasn’t a lot to add. But when He sends a “sign” that “sign” is drenched in Meaning. Every Christian alive – NO! Every person who claims they are a Christian - has experienced that moment when something like a bird lands on a lawn and reveals a Mystery that so great – so huge, folks, something that explains so much – that it a sign which just has to mean EVEN MORE! M't:10:29: Are not two sparrows sold for a farthing? and one of them shall not fall on the ground without your Father. M't:10:30: But the very hairs of your head are all numbered. M't:10:31: Fear ye not therefore, ye are of more value than many sparrows. Is true – which is has to be because Jesus said so, right there in the Bible – then obviously God had a grading system and he will apply this throughout Creation, including us! Although Adam named everything, God must have given Adam a big list of words in his head, otherwise Adam could not have spoken. God – in His Wisdom, must have given Adam a list that contained the names. That list was not merely “Inspired by God”! It WAS God’s direct list. OK. So it is now obvious that we can say God Grades Christians also, It is just that Adam did not need to give names to any Christians because he was the only “Christian” and he had a name, right? So why did he need any more description? The Lesser Christians -> Most of the other “social groups” an ornery grouping who idly chatter about The Lord on Sundays. Methodists, Quakers, other “fringe” religions. The Christians -> Episcopalians, Lutherans, etc. (The “Luke Warm”) Re:3:16: So then because thou art lukewarm, and neither cold nor hot, I will spue thee out of my mouth. Landover Baptist is the congregation of The Greatest Christians. Won’t you join us for a Way of Worship that is Approved By God? Pastor Bathfire, this should be printed as an obligatory commentary to KJV Bible. The logic is flawless, there are no baseless assumptions, just logical conclusions leading to more logical conclusions. I agree wholeheartedly that we at Landover Baptist Church belong to The Greatest Christians category. We follow the Word of God as is, no omissions or additions like the lesser varieties do. And I have no doubt that we are the only ones who will get admission to Heaven, while all of the lesser ones will whine in Hell. I will go now to pray for all of these unfortunate lesser Christians so that they can grow in their faith. After all, this is the season of giving, and a prayer is the best gift ever. It is encouraging to be reminded that Christianity is the only faith that's not a religion. From the promise made to the serpent all those years ago..
15 [God speaking] I will put enmity between thee and the woman, and between thy seed and her seed; it shall bruise thy head, and thou shalt bruise his heel. through the years of Jesus’ ministry, torture, death, resurrection and ascension into Heaven..
our Faith is based on historical events. Based on reality and not on rituals or indoctrination. The animals named by Adam really do exist. Those birds really do chirp. And none of them have ever proved suitable as helpers. When I see the Romish heretics or Lutherans or Quakers in their diminished status the "lessening" agent must be religion, intruding to various degrees. Such a contaminant reduces The Truth by superstition, rituals and dogma.—.all the trappings of religion.—.in many cases to such an extent, cannibals for example or goddess cults, that no Truth remains at all.